This collection consists of over 6,500 mineral specimens from all over the world and more than 13,000 rock samples from Israel and other countries including some very rare meteorite samples and other exotic rocks such as the Mottled Zone (Hatrurim) collection of ‘burnt’ rocks – Cretaceous organic matter rich rocks in Israel and Jordan that caught fire and underwent metamorphism at high temperatures. These colourful rocks decorate many buildings in Jerusalem (for example the Ballroom of the King David Hotel) and form the bright red rocks very visible on the road from Jerusalem to the Dead Sea in the road cut at Ma’ale Adumim. The Hatrurim collection, especially the rare minerals such as bentorite, has been requested by scientists and other people from all over the world. The unique specimens are on display at the Earth Science’s Institute Gallery, including a section dedicated to the stratigraphy and geology in the vicinity of Jerusalem. The collection also hosts donations from private collectors and samples that have been used for research in Israel. These include the outstanding Marcus collection with its emphasis on South African ore and Precambrian rocks including a selection of copper minerals from the famous Tsumeb mine in Namibia, where flooding has totally destroyed access to the underground deposits. The collection also includes meteorite samples from various parts of the world and at present we are in the first stages of systematic search for Meteorites that may have fallen in Israel. A number of the most unique specimens are displayed in the Earth Science Institute gallery, including exhibitions such as the crystal morphology of hematite, calcite, quartz and gypsum, forms and colors of mineral in nature, gemstones, fossils, unique volcanic samples and a section dedicated to the geology and rocks in the vicinity of Jerusalem. We also have a small fluorescent minerals exhibition. The Geological and Mineralogical collections are used by the Earth Science institute’s staff for reference, preparation of standards or calibration of the different analytical instruments of the institute. Organized groups, especially from the Nature Park and Galleries museum visit the Earth Sciences building and study the geology of Israel and other countries through the “eyes” of the collection specimens. The Belmonte science centre for youth promotes a program to encourage the teaching of geology at schools. The collection is frequently used for teaching geology students in different courses such as earth materials and mineralogy and petrology. 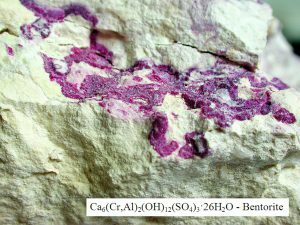 Bentorite is a rear sulfate mineral that was found only in Israel. 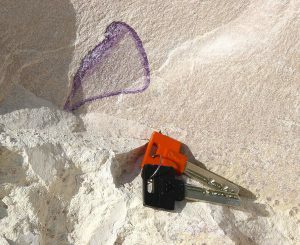 The mineral was first described in 1980 by Shulamit Gross (1923-2012) for an occurrence in the Hatrurim Formation of Danian age along the western margin of the Dead Sea, Israel. It was named for Yaakov Kurt Ben-Tor (1910–2002), one the first and leading geologists in Israel. The mineral has a violet to light violet color and it appears in veins of metamorphic rocks from the Hatrurim formation, mainly in calcite-spurrite marble. The mineral can be found on the geologic and mineralogical collection at the Institute of Earth Sciences at the Hebrew University of Jerusalem. Gross, S., 1980. Bentorite. 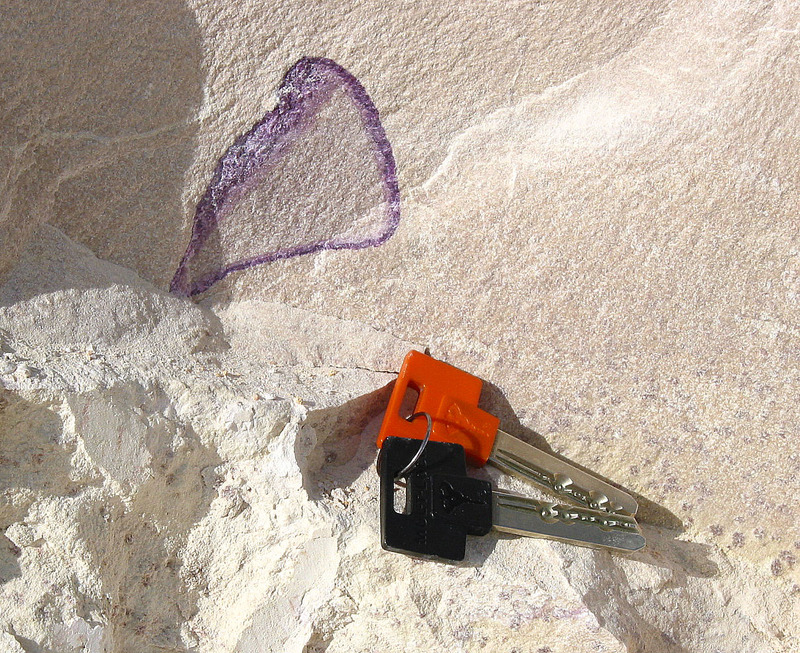 A new mineral from the Hatrurim area, west of the Dead Sea, Israel. Isr. J. Earth Sci., V. 29, pp. 81-84. 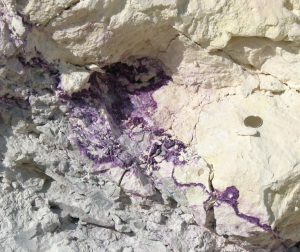 As far as we know, the mineral can be found in its place only in outcrops near Arad. The photos below were taken by Avi Burg and Yehoshua Kolodny. These images were taken near Ma’ale Adumim in an outcrop that no longer exists. We thank Avi Burg for the information and the photos. X-ray diffraction (XRD) is one of the most important techniques for the study of the mineralogy of geological samples. Whereas mineral identification is relatively simple if modern software and good mineral databases are available, accurate quantitative analysis of the minerals present in the sample remains a challenging task. One of the methods developed to achieve this goal is called Pattern fitting. This method is based on matching the whole XRD pattern of an unknown sample by adding variable amounts of intensity-scaled patterns of single-mineral standards. The standards patterns are obtained from measurements of natural pure (or near-pure) minerals. For best results the pure mineral standards must be run in the same instrument under the same analytical conditions as the samples. 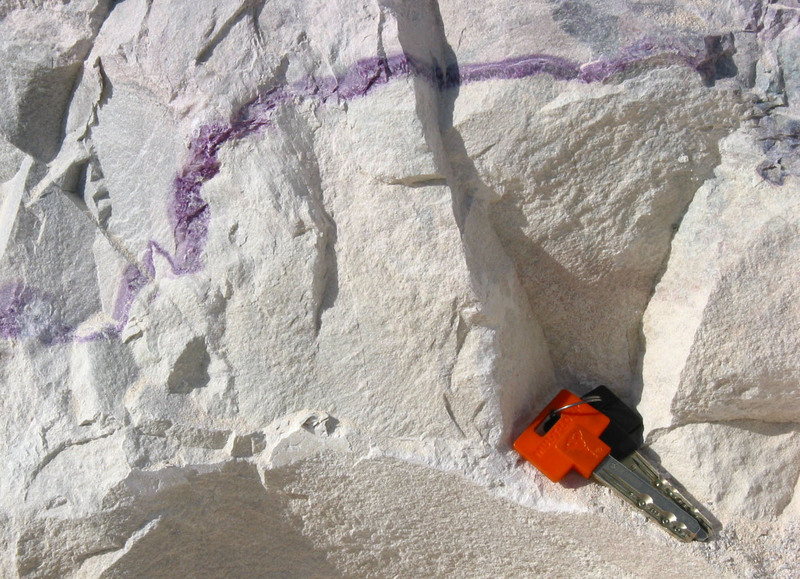 In order to standardize the new XRD instrument of the Geological Survey of Israel we use single-mineral samples received from the Hebrew University Mineralogy and Petrology collection. The standards developed from these samples will help us to improve the analytical capabilities of the Geological Survey XRD laboratory, which will benefit both institutions, the Hebrew University and the Geological Survey, through collaborative research work. We thank Dr. Navot Morag, the XRD lab manager at the Geological Survey of Israel for this explanation. Do you want to publish anything here?